~So, eat honey before sleep. The liver glycogen is the main fuel source for our brain, which is more awake during night time than daytime. When we go to sleep, our brain goes to work, consuming liver glycogen from the food we eat. And when the liver runs out of glycogen, the hungry brain experiences metabolic stress and triggers stress hormones, which overtime, night after night, can affect the rest of the organs in our body, leading to various health issues such as adrenal fatigue, weight gain, glucose intolerance, type 2 diabetes, high blood pressure, high triglyceride levels, cardiovascular diseases, thyroid disease, neuropathy, Alzheimer, etc. The glycogen storage capacity of our liver is about 75 grams. During sleep, every hourly the liver releases about 6.5 grams go to the brain and 3.5 grams go the kidneys and red blood cells, and this tallies about a total of 10 grams of glycogen fuel from the liver per hour. Our brain depends on this fuel to last for 6 to 8 hours during our night fasting - sleep. The liver makes glycogen from fructose and glucose in an equal ratio, and because honey contains fructose and glucose in the perfect 1:1 ratio, it is able to produce more liver glycogen per gram than any other food. The liver immediately turns honey into glycogen storage. If honey had only glucose, it would have gone into our blood without liver intervention, raising the blood sugar and releasing excessive levels of insulin that will drive the glucose into the muscles and fat cells, where it will be stored as fat. 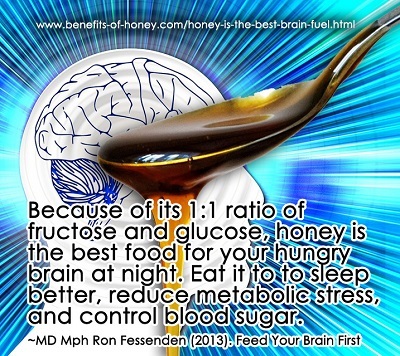 According to Dr Ron Fessenden, taking one or two tablespoons of honey just before bedtime is the most ideal way of fuelling our brain during sleep and eliminating metabolic stress. A tablespoon (21g) of honey contains about 7.5 grams of glucose and 8.6 grams of fructose, which will result almost 17 grams of liver glycogen. Two tablespoons of honey will then make almost 34 grams of glycogen. As the glycogen storage capacity of the liver varies according to gender, body weight, age, health, etc., we need to find out the suitable amount of honey for our own body. By the time we hit the pillow for the night, our liver glycogen from the dinner we take would have fallen below the full glycogen storage of 75g level required by the brain for 7 to 8 hours of sleep, but this problem is easily resolved -- restocking another 17 to 35 grams of glycogen by ingesting 1 to 2 tablespoons of honey would sufficiently supplement the brain for the long night fast. Honey offers the best of the nutrients from the nectar of plant blossom (without the fiber) that is converted by the honeybees into a concentrated mixture of fructose and glucose in an equal ratio. With this perfect composition of fructose and glucose, honey, unlike high fructose syrup in soft drinks and refined sugar in pastries and sugary snacks, is immediately absorbed into the body for food and energy. While every cell in the body is able to metabolize glucose, the liver is the main organ for metabolizing fructose. As pointed out by Dr. William J. Whelan, a biochemist at the School of Medicine, University of Miami, when fructose reaches the liver, "the liver goes bananas and stops everything else to metabolize the fructose". Studies have confirmed that consuming high fructose syrup can present great challenges to the liver and adversely affect blood sugar and insulin levels. Overtime, it can even lead to insulin resistance, obesity, and elevated LDL cholesterol and triglycerides. If you are still skeptical, try it, and see how honey is able to promote a deep and restorative sleep for you and support a healthy metabolism as your liver goes to work, breaking down the toxins stored in fat cells. 1) The Honey Revolution by Dr Ron Fessenden crushes well-known theories about dieting and myths about honey, one of the sweetest sweeteners: Health and Nutrition: 5 Jolting Findings. 5) A daily spoonful or two of honey taken prior to bedtime can help us sleep better and lose weight at the same time: How to Sleep and Lose Weight at the Same Time? 6) How to use honey to fuel your liver for the night, burn body fats when you sleep and, speed up fat metabolism: Honey Diet for Hibernation. End of "How to Sleep and Lose Weight at the Same Time?" Back to "Discover the Incredible Use of Honey in Hibernation Diet".